HP appears to be the beneficiary of brand choice for both the desktop and portables PC branded systems. 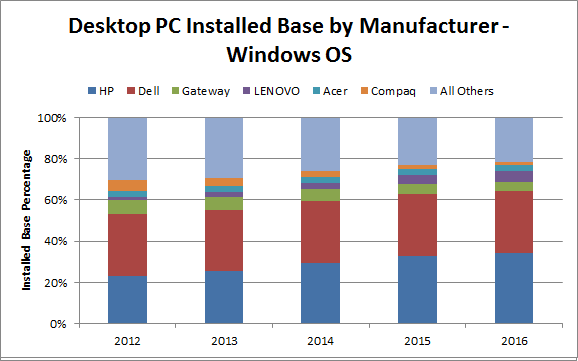 Its interesting to note that the two leading brands of HP and Dell currently makes up over 50% of PCs in use. Brand Loyalty – Have the rules changed? 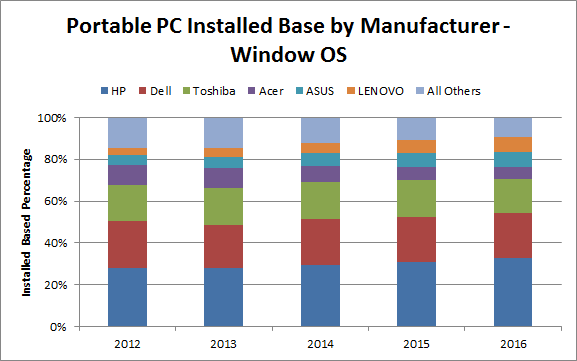 Research, The Pit Blog brand loyalty, PC installed base, PC manufacturers. permalink. I PREFER H.P. BECASE OF CUSTERMER SUPPORT, WHY, I AM 72 YRS OLD AND POOR (VERY) I HAVE NEVER BOUGHT A NEW PC SO I REPAIR ALL THE TIME THE ONE I AM USEING NOW I PULLED FROM A DUMSTER. (NOTE:) IF I BOUGHT A NEW PC IT WOULD BE A HP!!! @DAN: I’m 69, and my HP Pavilion, bought new in 2005, has been in daily use since then. It still has Windows XP, but since, in the early years, I corrupted it in some way (I still don’t know how) I had to buy a Dell version of XP and install that. I fitted a second hard-drive and installed Ubuntu as a dual-boot, and I’ve been using Ubuntu ever since. HP shouldn’t ought to make their PCs so good! I’m loath to replace it whilst it still works! The Geek Boys have joined in with concoction and variants of Avast along with there telephone number to get it off the screen. They put up a black screen so you can not see the desktop and pound you with there malware. If you are prepared you can use run to get REVO up and trash them. A call to them also keeping them on the line for 43 minutes is satisfaction.